Hello, Donna here with another layout I did using pieces from the August Club Q Kits. 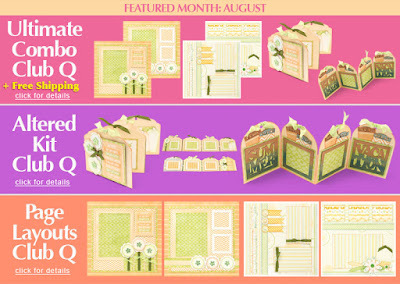 Even though this kit was for the summer, I also saw some autumn possibilities with the pretty pastel oranges and greens. 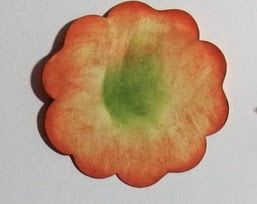 Below I will show you how I have made the distressed flower using PowderPuff Chalk Ink, near the bottom of the layout. This is a technique I learned from a Quick Quotes Workshop I attended a few years back! 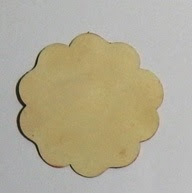 To make the flower the first thing I did was apply Antique Linen PowderPuff Chalk Ink that is a new color this year. This color is really awesome! Next in the center I added Limeade PowderPuff Chalk Ink, and inked the rest with Coral PowderPuff Chalk Ink. The edges I applied the ink extra heavy. I did notice you have to make the flower darker than you want, because after you spritz it with water the colors lighten up a bit. Do NOT worry if it's not perfect, it all works out in the end! Ink the outer part of the flower on the back in case it curls up a little. I spritzed it 2 or 3 times with water, and crumpled it up into a little ball. Let it dry. Once dry, open it up and you have a distressed flower. I did this with three different sizes so I could layer my flower. In the kit there are three sizes so that makes it super easy! All that worry about putting green it the middle didn't matter anyway, I covered the center with a button from the kit! It would have mattered if I used a small piece bling or a small brad in the middle. See the leaves above? 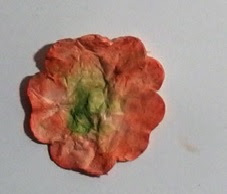 Taking two flowers from the kit, I made them using the same technique above, except do not let them dry all the way, maybe two minutes. 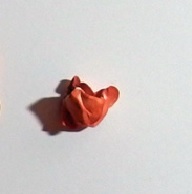 Very carefully open up the flower then fold the left third of flower into the center and repeat that on the right side. On the bottom I squeezed the flower together and there you have a leaf instead! love this layout! great elements!